When VIA, Pittsburgh’s Music and New Media Festival, began two years ago, the organizers created a space to showcase the intersection between art and music using atypical venues in the city to host the performances. 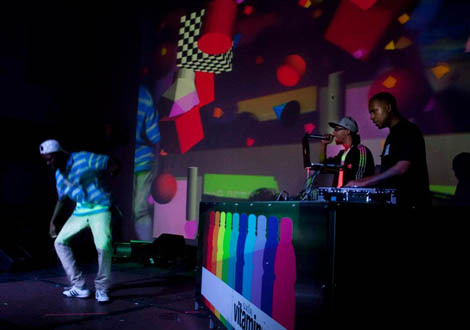 For the 2012 VIA festival, the promoters chose to host a decentralized festival to accommodate the bigger acts and crowds, while maintaining intimacy for the smaller events. The festival itself ran from October 1 to October 6, but I only attended the weekend events. The biggest events of the weekend nights were held at a former PNC Bank location which is scheduled to be demolished soon. The teller windows served as the bar and the bank was the perfect size for the draw of the festival acts and kept everything feeling close knit and full, but not packed. The other main venue highlight of the festival was 6119. The entrance to 6119 is in an alley, surrounded mostly by dumpsters and parking lots, and the venue’s off-the-beaten-path location lends itself to a speakeasy vibe. 6119 gets down to the task at hand quickly once inside with minimal décor, a no frills bar, and an open dance floor. The AV performances at the former PNC Bank were neat, but overwhelming at times. The images were projected on the wall behind the stage and then two times on each of the side walls of the venue. All of this video was initially really bright and distracting, but the bright videos on the side walls were eventually abandoned, which was a good call for ambiance. 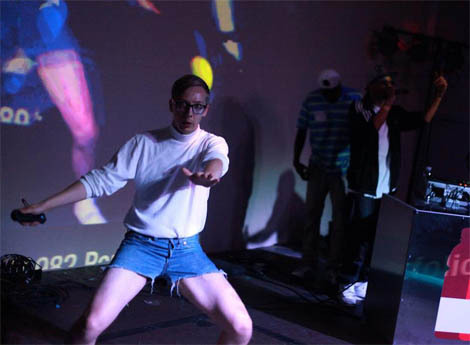 One of the most interesting video performers was Jeremy Bailey. His stage show involved him dancing on the stage, with his head and movements projected as part of a visual creation onto the larger screen that moved with him. Bailey would have been the perfect complement to almost any of the sets played at VIA except Spinn and Rashad, which is when he performed. Spinn and his boy Manny hosted a juke/footwork workshop earlier in the festival. DJ Manny was dancing on the stage during their set and and, at times, Jeremy got pushed to the side. It wasn’t intentional, but it was unfortunate because he was one of the AV artists at the festival doing something really innovative. The first workshop I attended was the aforementioned juke/footwork one, hosted by Manny and DJ Spinn (of Spinn and Rashad) on Friday night that promised to teach attendees some basic juke moves. Manny was very patient with the group, working everyone through some basic footwork moves at a snail’s pace. Juke and footwork are anything but slow, so it was funny watching the attendees try to speed up the new dance moves. The group as a whole was never able to put it all together at full speed, but had fun trying nonetheless. The other workshop at which I spent some time was the Babycastles Pop-up Arcade, which featured games made out of chopped up computer and game parts and otherwise built out of lo-fi building materials and stuffed animals. The Babycastles crew was excited to talk about creating games and talk to attendees about how they’re made and how they can learn to make them on their own. The first performer I saw at VIA, who I absolutely loved and knew nothing about prior to the festival, was Zuzuka Poderosa, from Brazil via Brooklyn. VIA described her sound as Baile-Funk, and it’s obviously Brazilian underground in beat and sound. Rapping and singing in Portuguese, Spanish, and English, her performance was high-energy and exciting to watch even if I couldn’t always understand what she was saying. At one point on Friday night, a man dressed in a full Steelers uniform took the stage and played a loud, thumping, 10-minute looped sample, which was eventually revealed to be a sample of an Alanis Morrisette song. While the loop played, Arby’s roast beef sandwiches and confetti were thrown at the confused crowd. It turns out that this instance was a thankfully short performance by Pittsburgh native Girl Talk. The “performance” was chaotic, confusing, and uninteresting. The first set of Friday night that the crowd was obviously excited about and waiting for was Tiger & Woods, who were billed by VIA as “a mysterious duo whose disco/boogie edits blend exotic sources with original production.” This description sounded exciting and the crowd seemed to agree. They definitely brought the party atmosphere to the old PNC. With the crowd warm after Tiger & Woods, the party kicked up a notch when Spinn and Rashad took the stage. In the juke/footwork workshop, when asked about juke, Spinn said, “The club is for dancing, not standing around looking cool.” Their set officially turned the PNC bank into a club. Everyone went wild with the sudden uptick in tempo. The DJ duo didn’t just stick to juke jams, but featured some ghetto-tech, Kraftwerk, and some unexpected pop tracks that made the crowd even crazier. The people who had attended the juke/footwork workshop earlier were found sharing high-fives, attempting the moves at the real tempo, and sweating buckets. After Spinn and Rashad closed out the main event, the party moved to 6119 for the after party with Underground Resistance’s Santiago Salazar. He transitioned beautifully from the party set of Spinn and Rashad into deep and hypnotic grooves. It was 5am before I knew it — the only way after parties should be. I caught the last half of Gatekeeper’s set on Saturday night. Living up to the sentiment of his name, his set was appropriately spooky in tone and well suited for the haunted October vibes. However, I found it wasn’t the best way to get the even going on the biggest night of the festival. One of the stand-out sets of the festival was Moodymann’s. 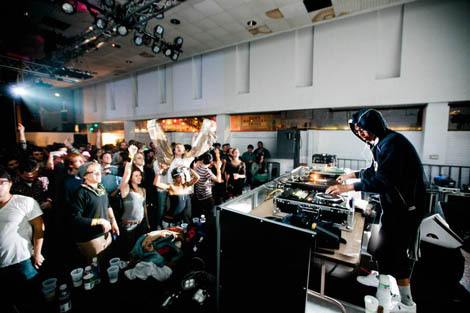 As a DJ, and as per usual, Moodymann delivered the funky house and techno he is known for. He handed out cups of Hennessy to the crowd and otherwise stuck to keeping people moving and grooving. Moodymann’s set was the longest I saw at VIA, and was by far the highlight of Saturday night’s line-up. One of the crowd’s most anticipated sets of Saturday night was Nadastrom. 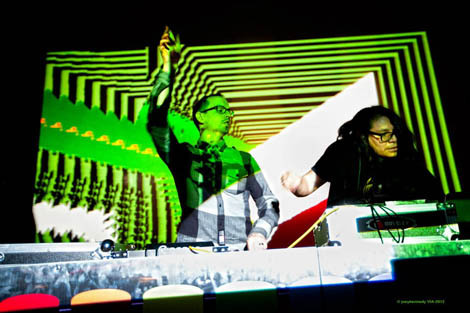 Nadastrom are known as the pioneers of Moombahton, a fusion genre of house music and reggaeton. On paper, it sounds fun, and the crowd was ready to party after Moodymann. Upon hearing the duo’s beats sans melody or harmony, however, many started to trickle out to the after party. I caught the end of Magic Touch’s set at the 100% Silk after party. It was intentionally very distorted and at times hard to listen to. Laurel Halo took the stage with a cadre of dancers, yet her set felt lethargic and somewhat inappropriate for a dance floor crowd at 3:40am. 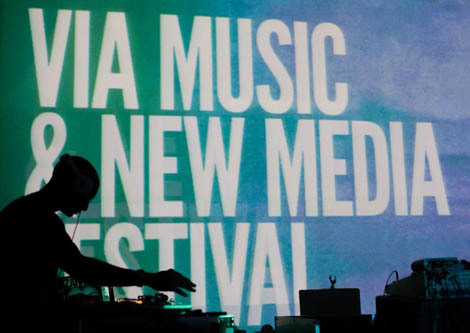 The best part of VIA is that it doesn’t sell itself as a music festival, but rather a multimedia festival. The variety of acts, visual and musical, catered to diverse musical tastes. At times it almost felt like the acts had little in common with those that played before and after them, but that was the intent of the VIA promoters. VIA could have better represented Pittsburgh artists by featuring at the main events. The lack of Pittsburgh musicians was weird as there are lots of cool things going on in Pittsburgh right now, particularly in dance music. Meanwhile, the majority of the visual artists were Pittsburgh based. The festival also lacked continuity between sets. It was treated more like a rock show than a club set, which caused a lot of energy to drain from the room while they switched equipment over for the next performer. They could have had someone DJ in between sets to keep the party going or staggered the live sets from the DJ sets to keep the music going. 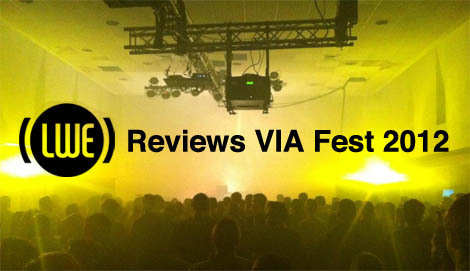 Overall, the performances at VIA varied wildly in genre, type and how well they were received. The variety of performances at VIA is what sets the festival apart from others, although a lot of them overlapped and the venues were far apart, so proximity was a problem at times. In the end, VIA is promoting music and various arts together and doing it in a way that attracts people outside of the standard music circle in Pittsburgh, which is great for the city’s culture. While improvements can certainly be made, VIA has learned from their execution of the festival from year to year, so I expect next year’s will be even better than the 2012 festival.